Ideas to Lower your Energy and Water Bills. 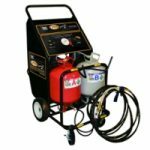 The Touch ‘N Seal CPDS Series 2 Machine combines convenience with efficiency by applying spray foam up to 2.5 times faster than the standard spray foam kit. It is a portable, constant pressure dispensing machine used to install Class I fire-retardant polyurethane foam. The foam is both insulating and sound attenuating. With a minimal investment, the CPDS Series 2 Machine provides a great opportunity for services looking to expand as well as start-up insulation businesses. This machine offers high profit with little maintenance, and eliminates the need for use of a bulk system with a mid-sized project (rehabs & renovations, repairs, room additions and “call backs”). Its yield is 20% greater than with the standard disposable polyurethane foam kits. This machine is also a more economical choice, with the cost for each board foot is less than that of the standard spray foam kit. Replacement parts for this machine are available. This spray foam equipment comes ready to use. All that is needed are the “A” and “B” polyurethane foam tanks. Included with the CPDS Series 2 are the tools necessary for application: a 30′ chemical delivery hose set, 50 disposable spray nozzles, 2 foam applicators, an operational DVD, and a set of manuals for operation and manuals. Chemical foam cylinders are available for both 1.75 pcf and 1.00 pcf Class 1, Fire Retardant polyurethane spray foam. The CPDS Series 2 is easily handled and transported by a single individual. It is ideal for those situations where a rig or bulk system is too much or disposable kits are too little. In this video, Joel Few with Carolina Aire and Mold Solutions discusses how he expanded his business with Touch ‘n Seal’s Constant Pressure Dispensing System (CPDS). The CPDS has made his business profitable and at the same time he is able to provide his customers with an air sealing solution that saves them money and increases home comfort level. Please enjoy 5% off on your next purchase with coupon code 5PCTOFFCM. Copyright © 2008-2016 Conservation Mart, LLC. All rights reserved.